Shopping for Alien / Aliens Artwork? If you're going into deep space, don't forget to bring a pet from the Weyland-Yutani Corporation! This Alien 35th Anniversary A Friend To You by Laurie Greasley Lithograph Art Print features an image of Jonesy, the orange kitty cat from Alien, carrying a dead chestburster alien in his jaws. 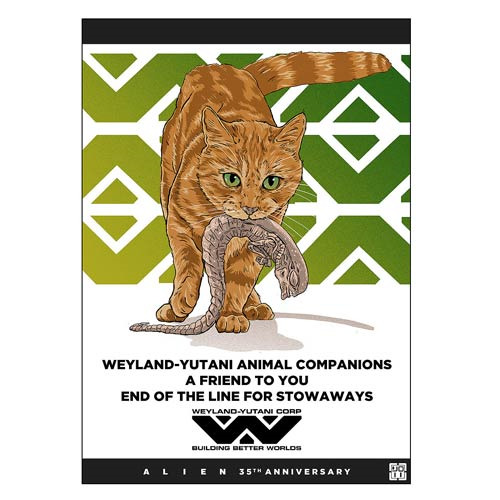 A fun and nostalgic faux advertisement poster for the Alien 35th Anniversary, the poster reads, "Weyland-Yutani Animal Companions. A Friend To You. End of the Line For Stowaways." A limited edition of 395 hand-numbered pieces, this awesome lithograph measures 24-inches tall x 18-inches wide and even comes with a certificate of authenticity!